Library at the Ivar Aasen Centre (2000), architect Sverre Fehn. 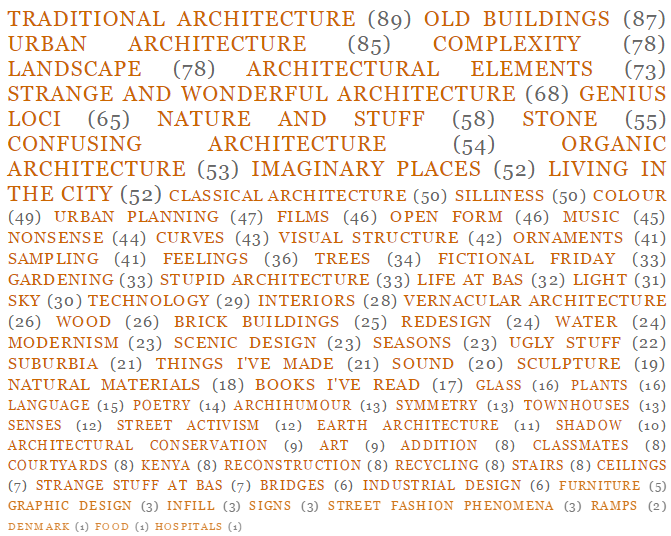 This is the archive of Kristian Hoff-Andersen's blog about architecture, life and art. 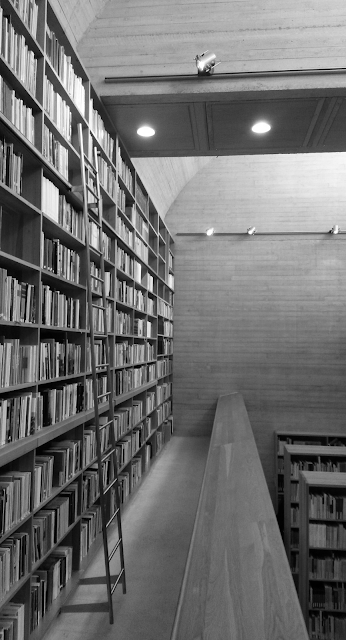 Here the reader will find pictures, text and videos concerning architecture, gathered and produced throughout four years of architecture school, travels, research and everyday life. The posts are a mixture between updates from school, theoretical musings and the everyday architecture I've encountered, with a particular emphasis on architecture in popular culture, fictional or otherwise. They are for the most part not very connected to the point in time in which they were written, and should be worth looking at still. I encourage you to make use of the labels found in the word cloud at the bottom of the page, or just browse through the dates, search for specific terms and look into whatever might evoke interest. The pictures are taken by yours truly, and can be used freely with credit. Enjoy! 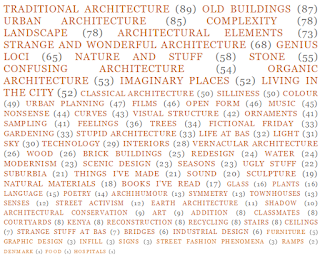 My word cloud, to be found at the bottom of this page. I'm quite proud of it. As my readers, may have noticed, this blog has remained quiet for some time now. Although I've loved working on it, I find that it's time to try out new channels and formats. For example, Norwegian readers may want to have a look at my little piece about the Deichman library, published in the latest edition of the magazine Minerva, which was released three days ago, on 21st September 2015. I will continue writing articles, essays and other kinds of text, and try to decide on a way of publisihing. A big thanks is in order when something like this ends. Thank you to all my friends, acquaintaces and strangers who've followed me, thank you for your comments and feedback, and for reading my simple thoughts on this enormous and microscopical field of society. Thank you to everyone who inspires me, to architects still present and long gone, and most importantly, to the people who want to make architecture that engages with society. You bring us forward. Great post and thank you so much for share your good piece of content with us.